While I was at home, I parted ways with a good foot of my hair. And, for those of you that care to know, I donated the hair. I must admit, donating my hair wasn't my first thought, but I felt guilty and decided to donate it after someone (oh, you know who you are!) brought it up. But back to my hair. The haircut has received mostly rave reviews, but some people haven't hid their true feeling about the hair very well. When my mom first saw it, she gave me the most awful look. She has tried to deny it, but I have Chandra as my witness on that one! Anyway, today I had a funny encounter about my hair with a regular customer at my store. This family lives right behind my store and drops in a couple times a day. Regular Customer (RC): OMG, look at your hair! It looks so great! Regular Customer's 5-year-old Daughter (RCD): I liked your hair better before. Me: Ummm, thanks RCD for telling me like it is. RC: RCD, that's not a nice thing to say. Women like complements. RCD: But I'm being honest, I did like it better before. Oh kids, they certainly don't do a good job of hiding their true feelings! 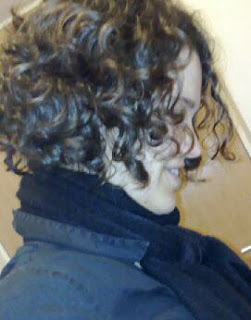 And about my haircut, I love it, and isn't that the only opinion that really matters?!? Just for the record, I now like the hair cut. . . It was the straight do that I was surprised by, I like my curly hair girl! I just found this post (it was recommended on one of your more recent ones) and I LOVE this cut! I can't even imagine you with long hair. What's the first name of your first child?